Skinny Baked Eggplant Bruschetta uses crispy baked eggplant slices instead of toasted bread and is the perfect healthy alternative to classic bruschetta. Last night a girlfriend of mine asked me to be a bridesmaid in her wedding. Of course I said yes! I am so thrilled that she wants me to be a part of her special day and I really couldn't be more excited about it. As I sat on my couch after her phone call I began daydreaming about weddings; flowers, dancing, champagne and beautiful dresses. Then it dawned on me. I'm going to be in her wedding photos in one of those beautiful dresses I was dreaming about (seeing as I'm a bridesmaid and all). I want to make sure I'm looking my best for her big day! I've been on a good trend as of late eating healthier than I have in quite some time. I've lost about 30 lbs since the birth of my son 10 months ago, but I've still got a ways to go before I'm in tip top shape. It's been pretty easy sticking to a healthy lifestyle this summer thanks to our veggie garden. Eggplant is one of the things that we're growing, so I've been preparing it in all sorts of different ways. I decided that today for lunch I would continue with my healthy eating kick. 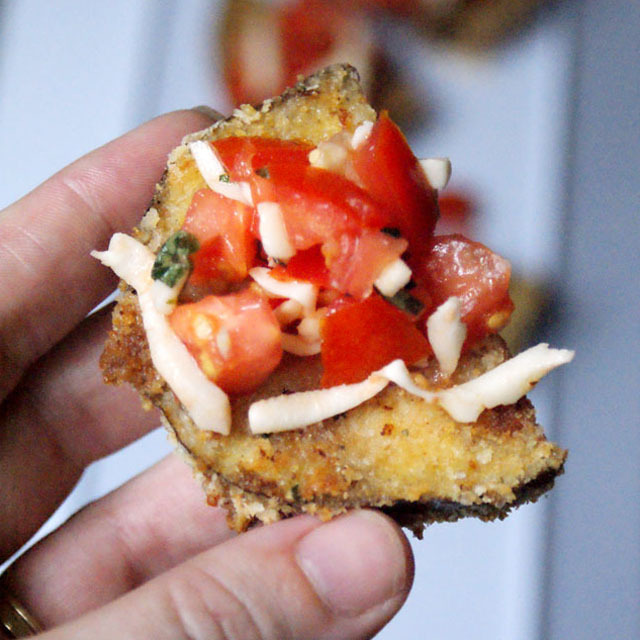 I made crispy baked eggplant slices and topped them with a light and fresh bruschetta topping. Skinny bruschetta! It was perfectly delish! 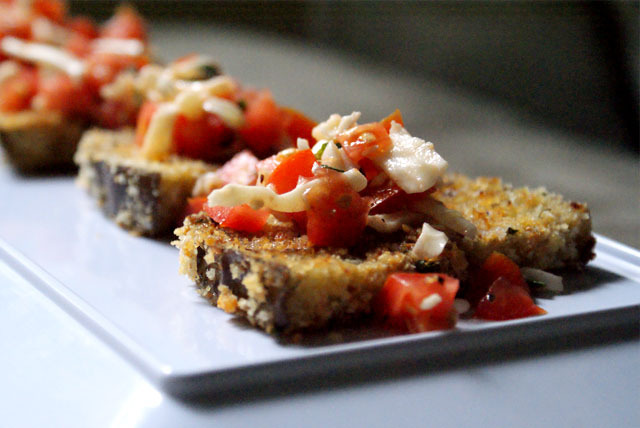 The eggplant was a great alternative to the toasted bread slices used in traditional bruschetta and healthier, too! If I keep making good choices like this, I know I'll be picture-ready on my friend's big day! In a small mixing bowl, stir together the diced tomato, fresh garlic, olive oil, balsamic vinegar, mozzarella cheese and fresh chopped herbs. Season with salt and pepper. Cover and place in the refrigerator until ready to serve. Preheat your oven to 350°. Line a baking sheet with aluminum foil. (You may need two baking sheets.) Drizzle the foil with a few tablespoons of olive oil. In a shallow dish, beat the eggs with a whisk. 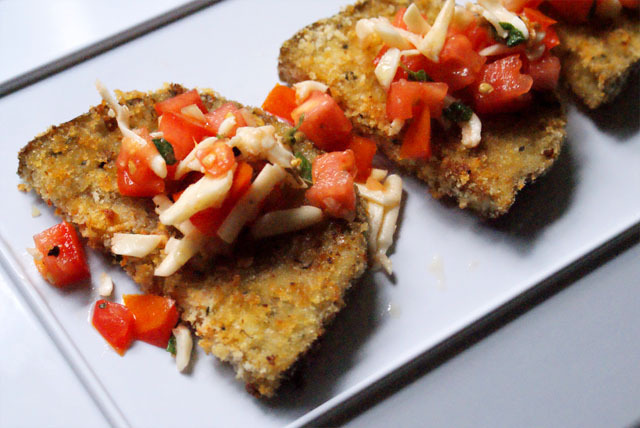 In another shallow dish, combine the seasoned breadcrumbs, panko breadcrumbs, parmesan cheese and garlic powder. Cut the eggplant in to small pieces that would be easy to pick up with your hands. (Roughly 2½ inches in diameter. Slicing my slices in half was perfect for mine, but it all depends on the shape of your eggplant. If your eggplant is long and skinny, you might not have to cut it at all.). Dip the eggplant slices into the egg and then into the breadcrumb mixture, pressing the breadcrumbs into the eggplant so that they are completely coated. Place on the foil lined sheet. Repeat until all of the eggplant is breaded. Drizzle with breaded slices with a few more tablespoons of olive oil. Bake the eggplant slices in the preheated oven for 10 minutes. Flip the slices and return to the oven for and additional 10-15 minutes. The eggplant should be golden brown and crispy on the outside. Let the eggplant sit for 3-5 minutes (or until it is cool enough to pick up the slices with your hands). Using a slotted spoon, top the eggplant slices with the tomato mixture and serve immediately. This can be served as a finger food appetizer, or a light lunch or dinner with a fork and knife. I love tacos! I’m ready to eat it all the time (as well as sushi), but I’m too lazy to cook it. Move to me, cook it for me. And I’ll cook for you something with my 1.5 cup rice cooker . That’s pretty tasty!